Premier League football returns as Burnley make the 35 mile trip to Old Trafford. Let’s take a look back over the previous clashes between the two sides. The first recorded fixture took place in 1892 with Manchester United, then Newton Heath, hosting a 1-1 draw in the league. It would not be until the next season that the Reds would record their first win against the Clarets. An Alfred Farmen hat-trick was too much for the Lancashire side as Newton Heath ran out 3-2 winners. The first FA Cup tie was one to forget for the Reds. Taking place in February 1901, the initial match was a 0-0 draw, but in the return fixture Burnley inflicted a heavy 7-1 defeat. During the period of 1914-1921, Burnley would infect go unbeaten against United, beating the Reds on all nine fixtures between the two sides. However, by the late 1960s, this period of dominance was well and truly over, since then Burnley have only beaten United on one occasion, a Premier League clash in 2009 through a Robbie Blake goal. The 1984/85 season saw the sides meet in the League Cup second round, this two legged affair saw United score 7 unanswered goals to knock Burnley out of the competition. Most recently, United travelled to Turf Moor in September. 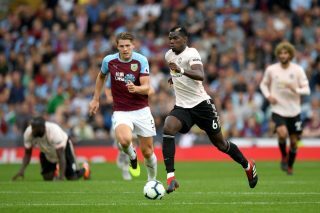 What had been a rocky start of the season seemed to take a slightly positive turn as Mourinho’s side comfortably beat Burnley 2-0 through two Romelu Lukaku goals, despite Marcus Rashford’s sending off. Ole Gunnar Solskjaer will be hoping to continue his winning start as caretaker manager against Burnley at Old Trafford, and the overall records suggest he will with 61 victories in Manchester United’s favour, 44 in Burnley’s, and 22 draws between the sides.